Become a Certified Reality-Based Facilitator! Learn how to teach the Reality-Based Leadership Philosophy within your organization! If you are interested in attending this certification course, call 402-763-8963 or email Alex Dorr to learn more or sign up. Interested in certifying a large group at your organization? Contact Alex Dorr for more information. Become a Reality-Based Certified Facilitator so you can deliver Cy Wakeman’s revolutionary content in your own organization! You’ll also have the opportunity to network with like-minded leaders from other organizations and share best practices on how to infuse the Reality-Based principals in your workplace. 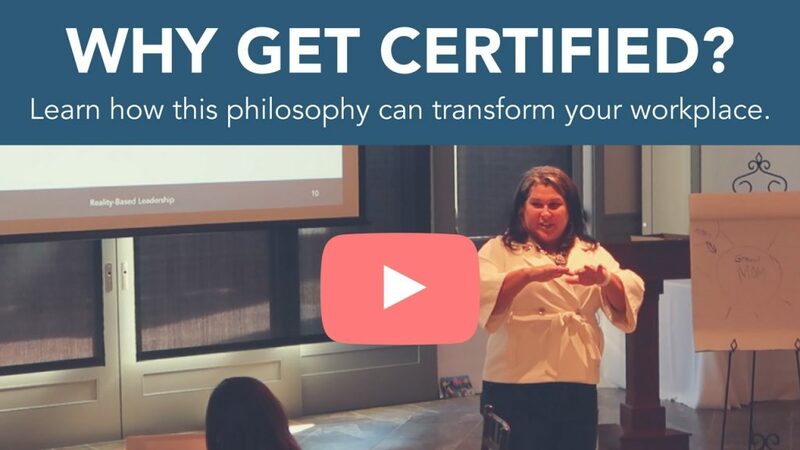 Reality-Based Certification classes provide deep insight into the Reality-Based Philosophy and an experiential learning environment to practice and apply the tools and concepts. While we train you how to train the Reality-Based Leadership content, we also recognize that your role as a leader or influencer calls you up to use the Reality-Based Leadership philosophy in your own life and to coach others to do the same. We will teach you how to teach the philosophy, and we will also ensure you leave with the tools you need to lead groups and individuals to greatness. This is your first step to joining the Reality-Based Facilitator Community! This three-day program will introduce you to the ins and outs of how to successfully deliver Cy Wakeman’s Reality-Based content to those inside your own organization. On Day 1, you’ll walk through the foundational principals of the Reality-Based Philosophy and best practices for the most impactful facilitation of the programs. On Day 2, you’ll have a chance to present a portion of the material back to the class and receive live feedback and coaching from Reality-Based Leadership content experts! 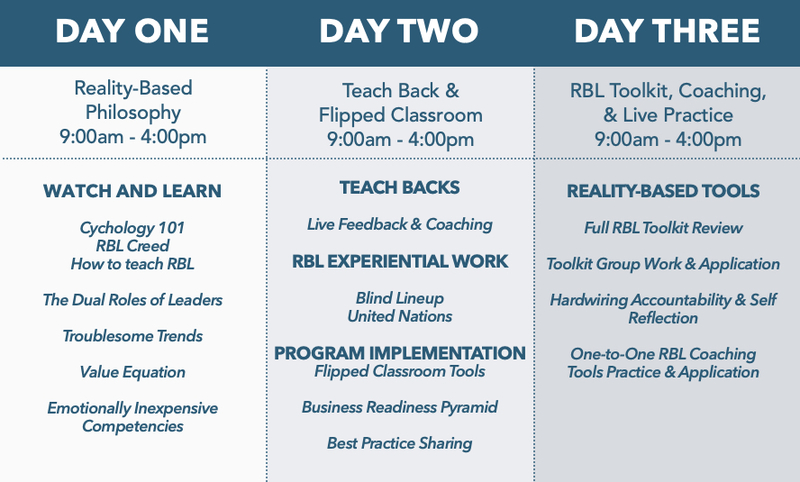 On Day 3, you’ll have a chance to dive deep into the Reality-Based Leadership Toolkit. You’ll spend the day in live practice and coaching with tools for groups and practicing the 1-1 tools. We will be there supporting you as you practice these valuable ways to shift energy away from drama into results and cultivate accountability. Participant Licensure Fee: $100 licensure fee/course is required for each participant you teach the program content to. The fee includes 12-Month access to the Virtual Training modules, tracking of progress, downloadable tools, accountability reports and intellectual property. This also includes access to our flipped classroom framework. RBL facilitators and participants love this option as a way to keep learning sustainable and apply the practices to solve real-time business challenges. In order to keep your status as a certified Reality-Based Facilitator current, an annual fee of $400 is required. The fee includes your access to the Facilitator Success eToolkit which is all delivered through our Virtual Training Platform. *The annual fee for your first year is included in the cost of the certification class. If you are interested in certifying a large group at your organization, contact Alex Dorr for more information. “Most of my leadership is composed of hard-working men that have worked their way up from the shop floor. They are a tough crowd, and they are all-in with Cy’s Reality-Based Leadership philosophies. The drama and stress they’ve felt is melting away as they work with the coaching techniques and on reducing their own emotional expensiveness. I was a Cy Wakeman fan before I went to the RBL Certification Course, so I felt like I knew the material pretty well, but I gained so much more knowledge from Alex during the course. It was worth every moment, especially now that I’ve seen first hand how it’s affected our organization. Thank you, Thank You, Thank you!” – Denice Tally – Human Resources Manager – Special Projects Amfabsteel, Inc.
“After reading Cy’s book No Ego, I realized that I was leading my team using methods based on outdated, traditional leadership doctrine that just doesn’t work in today’s world. My experience at Certification brought the Reality-Based Philosophy to life and was easily the best 3 days of learning I have ever had. Bringing this back to my team, I finally feel like I have the language and mental process tools to bring my team out of drama. Cy, Alex and the rest of the RBL team, I can’t thank you enough!” – Tessa Felix – HR & Operations Lead, Investment Advisor at PWL Capital Inc.
- Support daily practices, immediate application and light a new path for leaders within the facilitator’s organization. - Bring the message to the workplace that transforms lives in the worldplace. - Truly call people up to fulfilling their missions at work and their mission in life. - Provide the safe place and a sane voice that provides tools that actually work and their organization’s employees and leaders can actually use – today. - Provide their organization with counter-intuitive and researched based, unique content and insights to reduce the emotional waste and improve bottom-line results. - Challenge conventional wisdom and re-redefine the role a leader and the work of HR. - Learn, live and teach evidence-based social psychology and behavioral economics principles that cultivate happiness leading to better results and success in their organizations. What should I expect from the certification? The Reality-Based Leadership certification provides more than just the ability to deliver the Reality-Based Leadership content in your workplace. It provides you the foundation of the evidence-based philosophy that powers the work. You will be immersed with other leaders as Alex Dorr reveals the social psychology, behavioral economics and brain science that grounds the bold truths of why the philosophy simply works. *Please note that the registration fee does not include any travel costs. Why should I come to certification versus bringing out someone from RBL corporate? Certified Facilitation generates Better ROI for your Company! The initial investment in certifying someone in the content allows for ongoing workshops to be conducted in your organization at any time and for any length. Certified individuals are able to sustain the message with members of the organization by promoting and training daily practice of the philosophy! This becomes a more financially viable option than bringing in a Reality-Based speaker multiple times to train in your organization. You have the value of having a Reality-Based EXPERT, on-hand and accessible at any time you need! - First access to new resources, case studies and training! $100 per participant per course you are training. This covers access to the Virtual Training modules, tracking of progress, downloadable tools, accountability reports and intellectual property. There is a non-refundable administrative fee of $500. Cancellations within two weeks of the course forfeit refunds but will be able to attend the next available course. What if I don't pass the certification on the teach-back? Attendees who don't pass the certification course on the teach-back day will have the option of reteaching the content virtually to obtain complete certified facilitator status. Will Reality-Based Leadership bring the certification course to other cities? If a company would like to hold a private certification course for their employees, we would be happy to travel to them. This has been beneficial for companies committed to implementing the Reality-Based Philosophy across their organizations. What type of support is included once I become certified? Am I able to be certified virtually? At this time we will not be holding certification courses online. On the teach-back day, participants will present a predetermined section of the course in front of Cy Wakeman and Alex Dorr who will answer any questions the audience may have. We believe it's important for participants to interact with one another at the program. Are we required to bring computers? You are only required to bring a positive attitude to the certification courses. As far as note taking, please use the method you prefer. What if my company already has an established coaching model or framework? That’s great! The Reality-Based Leadership philosophy provides you simple and practical tools that you can use from your broader coaching conversations to your impromptu hallway chats. All of our work helps you keep feedback relevant and short, and gives you endless ways to encourage self-reflection, which is the birthplace of accountability. (402) 763-8963 or drop us a note. You'll be hearing from us very soon!